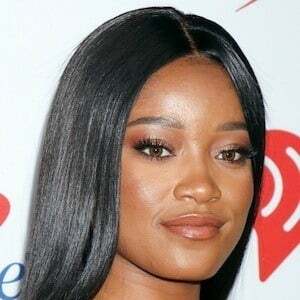 Actress who played the lead role in the 2006 film Akeelah and the Bee. She also appeared in Barbershop 2: Back in Business, Joyful Noise and Rags. In 2015, she became a series regular on the Fox horror/comedy series Scream Queens and in 2016, she portrayed Marty in the live broadcast of Grease on Fox entitled Grease Live! She starred in the Nickelodeon sitcom True Jackson, VP and became the fourth highest paid child star on television at the time. She voiced Peaches in the Ice Age franchise and voiced the characters Aisha and Piff on season 6 of the Nickelodeon series Winx Club. Keke's parents, Sharon and Larry Palmer, moved to California in the early 2000s so that she could pursue her acting career. She has a sister named Lawrencia. She made an appearance in Jump In! with Corbin Bleu.